At about 4:45 PM, on Thursday, April 18, 2019, officers assigned to District E-18 (Hyde Park), while in the area of 19 Millstone Street, observed Deborah Gideon, 53, of Hyde Park, toss what appeared to be red powder in the air and into the street. Further surveillance of Gideon led officers to the area of Mount Hope Cemetery where they observed her exit her motor vehicle, approach some headstones and make a tossing motion with her hand. Gideon got back into her motor vehicle and drove further into the cemetery where officers initiated a traffic stop. As officers approached the motor vehicle, they observed a spray bottle in the front passenger side, a gallon of a reddish liquid, containers of various colored salt, powered juice mixes, and olive oil. Ms. Gideon was placed under arrest and charged with, Attempt to Commit a Crime to wit: Vandalism of a Gravestone and Malicious Destruction of Property Over $1200. Ms. Gideon will be arraigned in West Roxbury District Court. Assault by Means of a Dangerous Weapon To Wit Firearm. 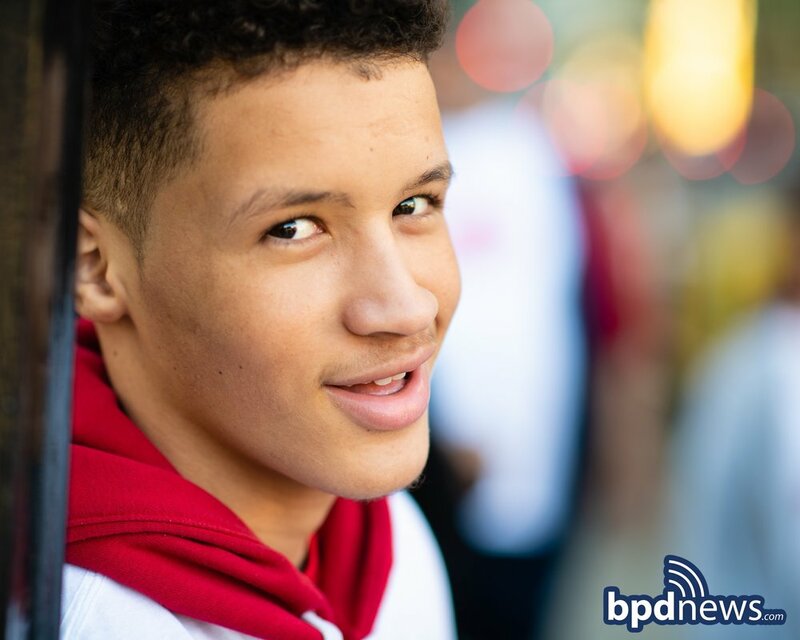 BPD in the Community: We Belong - Youth Through Leadership Program Visits Washington D.C.
BPD in the Community: On Wednesday April 17, 2019, members of the BPD boarded a bus bound for Washington D.C. with a group of thirteen area youths to begin a four-day trip focused on civic engagement. 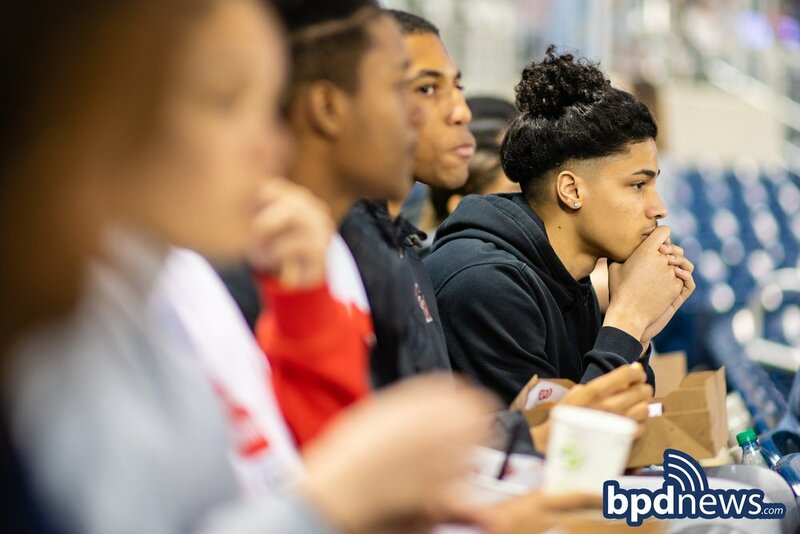 The trip was planned as part of the We Belong: Empowering Youth Through Leadership Program which was established to help young people succeed by connecting them with civic leaders, nonprofit and business executives and elected officials. 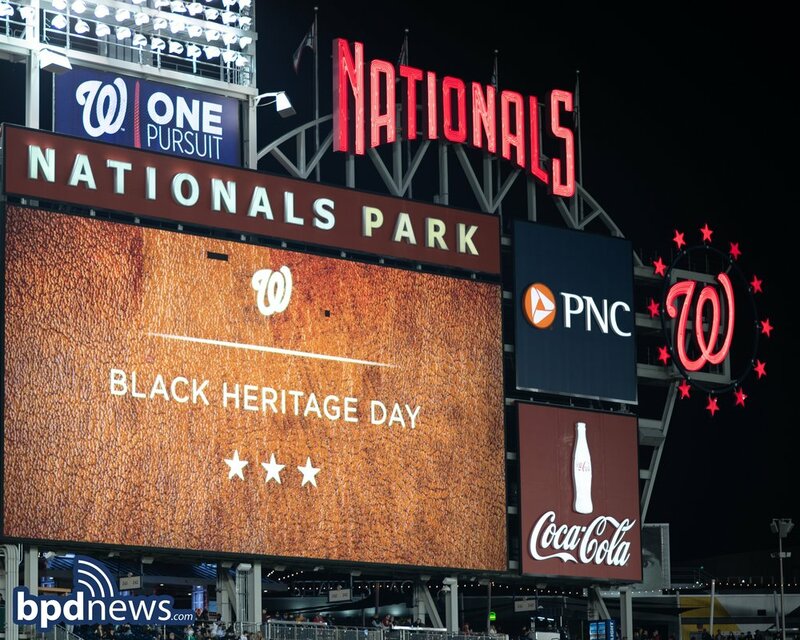 For their first group activity, they went to enjoy a Washington Nationals game which was played in honor of Black Heritage Day at Nationals Park. We look forward to seeing what adventures await as their week goes along. Enjoy your time in our nation’s capital and be safe! At about 8:20 PM on Wednesday April 17, 2019, officers assigned to District D-4 (South End) responded to a call for a sexual assault at the House of Blues located at 15 Lansdowne Street in Boston. Officers arrived on scene and observed a large group of approximately 200 people waiting outside the venue. Officers entered the building where they encountered approximately 800 people inside who appeared to be growing restless while awaiting the start of the scheduled performance. After an exhaustive search, officers were able to locate the victim and escorted the party outside to a waiting ambulance for treatment and evaluation. While the officers continued to attend to the victim, the crowd both outside and inside the venue grew unruly upon learning that the headline performer of the show would not be appearing. Officers called for additional responding units to assist with crowd control and dispersal. Through their coordinated efforts, officers, supervisors and command staff members were able to restore order and clear the area after about thirty minutes. There were no reported injuries on scene. Officers arrested, Samuel Simmons, 20, of Newton after a brief struggle after observing him push and punch members of the House of Blues security staff while attempting to regain entry through an emergency exit door. The suspect will appear in Roxbury District Court on charges of Assault and Battery, Disorderly Conduct, Resisting Arrest and Trespassing. A Licensed Premises Violation was issued to the House of Blues for both the sexual assault and the altercation involving the patron and staff member. The investigation into the initial sexual assault is deemed classified and remains active and ongoing at this time. Great Work Recognized: Earlier today, on Thursday April 18, 2019, Commissioner Gross presented a commendation to Boston Police civilian Tyler Bovitch, assigned to the BPD Forensic Group. Mr. Bovitch was recognized for his contributions to a number of investigations conducted by the BPD Homicide Unit’s Fatal Collision Investigative Team. For his professionalism and continued support, he is hereby awarded a Commissioner’s Commendation. UPDATE: At about 11:10 PM, on Saturday, April 13, 2019, officers assigned to District B-3 (Mattapan) responded to a radio call for a person shot in the area of 12 Violet Street in Mattapan. On arrival, officers located two male victims suffering from gunshot wounds. Both victims were transported to local area hospitals where they were pronounced deceased. 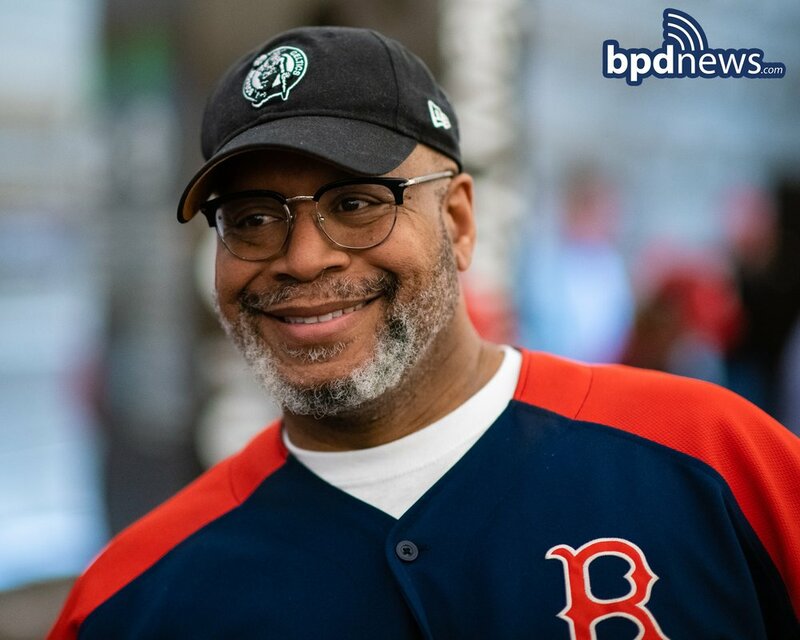 The victims have since been identified as Michael Dukes, 53-years-old of Hyde Park, and Kevin Boyd, 53-years-old, of Roxbury. At about 6:31 PM on Sunday April 14, 2019, officers assigned to District A-15 (Charlestown) recovered a plastic bag containing 96 oxycodone pills from inside a motor vehicle during an investigation in the area of 275 Medford Street. Officers were originally called to the area after a call for shots fired which resulted in an adult male victim self-applying to an area hospital for treatment of a non-life-threatening gunshot wound. Officers later determined and confirmed that the evidence recovered belonged to Jonathan Libbey, 32, of Charlestown, who was not on scene at the time of the investigation. At about 7:35 PM on Monday April 15, 2019, officers located and arrested the suspect without incident in the area of Commercial Street and Charter Street in the North End. The suspect will appear in Charlestown District Court on charges of Possession with Intent to Distribute Class B Drugs. The Boston Police Department is seeking the public’s assistance to locate 10-year-old female Sofia Mendez. She was last seen by the Boston Marathon Finish Line. She is slender build, 5'2” tall, and wearing the above pictured clothing. 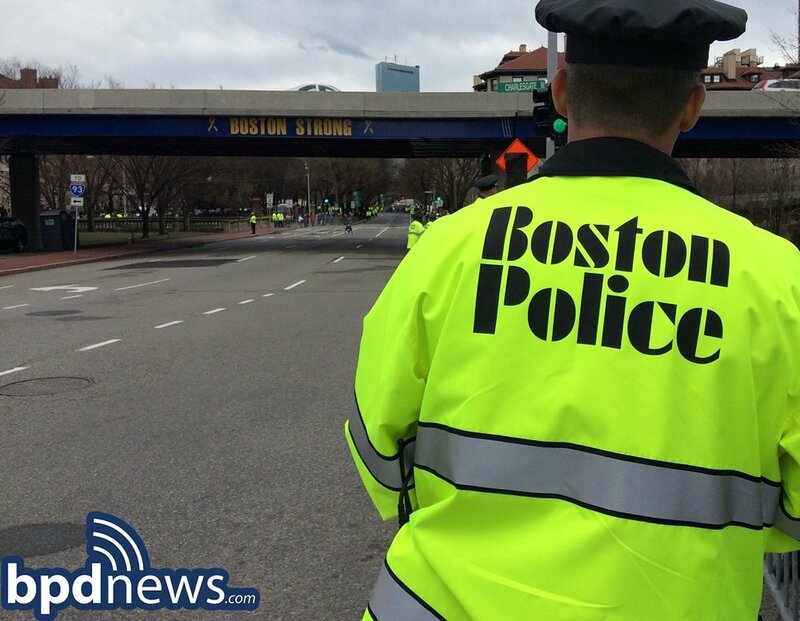 As the men and women of the Boston Police Department prepare for the 123rd Running of the Boston Marathon, we take a moment to remember the lives lost six years ago and their legacy which lives on today. In memory of Martin Richard, Lingzi Lu, Krystle Campbell, Officer Sean Collier, and Sergeant Dennis Simmonds, we remain Boston Strong as we honor those who are gone but not forgotten. BPD Remembers the Service and Sacrifice of Officer Ward M. Bray Killed in the Line of Duty on This Day 98 Years Ago: On this day 98 years ago, April 14, 1921, Officer Ward M. Bray was killed when his motorcycle was struck by a commercial vehicle in the area of Centre Street and Walter Street in Jamaica Plain. Officer Bray was carried by a fellow officer to a doctor passing by who pronounced him deceased at the scene. A United Stated Army Machinist in World War I, Officer Bray was a 2-year veteran of the department and 26-years-old at the time of his death. Making his line of duty death ever more tragic is the fact that he left behind a grieving wife, his mother, and his sister. Officer Bray was laid to rest at Acorn Cemetery in Rockland, Maine and his name is located on the National Law Enforcement Memorial on Panel 27, West Line 10. In Boston, a Hero Sign is posted at the intersection of Centre Street and Seaverns Avenue in Jamaica Plain to forever honor the memory of a man who gave his life in service to his city. If you’re in the area, keep an eye out for his Hero Sign and kindly take a moment, not only to honor his sacrifice, but to remember the loved ones left in mourning after his tragic passing so many years ago. At about 8:50 PM on Saturday, officers working a paid detail in District A-1 (Downtown) at 100 Legends Way (TD Garden) assisted security with escorting a male and female patron from the premise. Officers assisted event security with removing the male patron with relative ease. When officers attempted to remove the female patron, they were met with violent resistance. The female began screaming at officers, threw herself to the ground and refused to leave the premise. The female became physically combative and kicked one of the officers. The female was told she would be placed under arrest for assaulting the officer. At this time, the female, still on the ground, rolled over and tucked her hands underneath her body while lying on her purse refusing to comply with officers’ commands. The female kicked at officers and spit on them before biting one of the officers on the arm. Eventually, the female was placed in handcuffs and escorted to an elevator in an attempt to avoid the stairs, due to her violent nature. While on the elevator, the female became combative once again kicking one of the officers with full force. The suspect was removed from the elevator and continued her assault in the stairwell, kicking officers, tying up their legs with hers, causing them to fall multiple times, and digging her nails into the skin of one of the officers. The female was eventually placed on a stretcher with the assistance of Boston EMS and event security. While on the stretcher, the female kicked the EMTs and spit on a staff member. Officers placed a spit hood on the female and transported her to the district station where she refused booking after throwing a cup of water on the booking officer. The female, identified as Stephanie Lavoie, 32-years-old, of Waterbury Vermont, was eventually booked and is expected to be arraigned in Boston Municipal Court charges of Assault and Battery on EMS Personnel, Disorderly Conduct, Assault and Battery, Resisting Arrest, and six counts of Assault and Battery on a Police Officer. 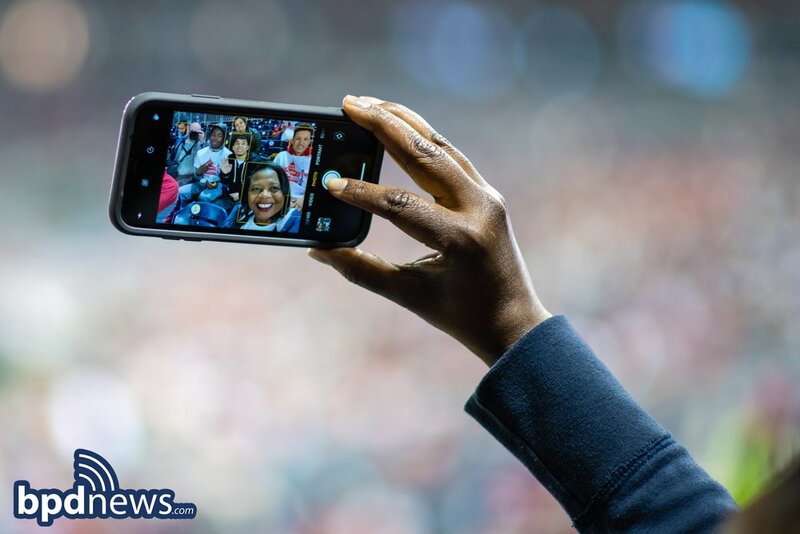 DEATH INVESTIGATION: At about 11:10 PM, on Saturday, April 13, 2019, officers assigned to District B-3 (Mattapan) responded to a radio call for a person shot in the area of 12 Violet Street in Mattapan. On arrival, officers located two male victims approximately in their late 40’s, suffering from apparent gunshot wounds. Both victims were transported to local area hospitals where they were pronounced deceased. BPD Remembers: Today, the men and women of the Boston Police Department remember Patrolman Thomas A. Davis who was killed in the line of duty 80 years ago today. Patrolman Davis died as a result of injuries he sustained while making an arrest on Thursday April 13, 1939. Patrolman Davis was 49 years of age at the time of his death and had served with the department for 20 years. Patrolman Davis was laid to rest at the New Calvary Cemetery in Mattapan. His name is located on the National Law Enforcement Memorial, Panel 50, West Line 8. His name is also located on the Boston Police Department hero wall at Headquarters and the State House. As you go about your day today, please remember the service and sacrifice of Patrolman Davis as well as the loss his family, friends and loved ones endured so many years ago.